Bits of My Own: Beach Roses is Finished! This was a fairly quick stitch. 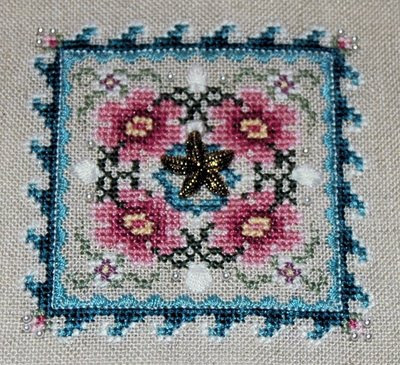 I finished the stitching part Thurdsay evening, and spent Friday and Saturday evenings sewing on the 20 pearls and the starfish charm. I think I might even have a frame in my attic that will suit it. I will post it as soon as it is framed. Beautiful finish, I love the colors on this. JN pieces are so pretty and elegant. Erica, that is so beautiful, the colours are gorgeous. I just love JN designs. Beautiful! And good luck with your surgery. Beautiful finish. Hope your stashed frame is a perfect fit for the design. Look forward to seeing it framed.